Last spring, the Archdiocese of Indianapolis purchased the Carmelites’ 17-acre monastery property for use as the Bishop Simon Bruté College Seminary after the nuns decided to move to a smaller, cloistered home in Theresa Hall at the motherhouse of the Sisters of the Third Order of St. Francis in Oldenburg. On behalf of Archbishop Daniel M. Buechlein—who is recuperating after completing several months of successful cancer treatments—Msgr. Schaedel presented a proclamation to the Carmelite sisters in gratitude for their seven-and-a-half decades of prayerful presence at the monastery on Cold Spring Road near Marian College in Indianapolis. It’s appropriate that the Carmelite sisters have moved to the campus of the motherhouse of the Franciscan sisters, the vicar general said, because St. Francis of Assisi was described as “a living prayer” and was known for living in the present moment without concern for the past or anxiety about the future. Our Lady of Mount Carmel is one of 2,600 titles that honor Mary, the mother of Jesus, he explained, throughout the world. 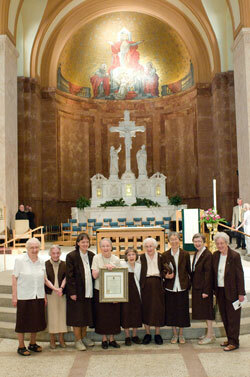 Carmelite Sister Jean Alice McGoff, prioress, offered her community’s thanks after accepting the proclamation. Before the special feast day liturgy, Carmelite Sister Teresa Boersig said the sisters are busy settling into their new cloistered home on two floors of Theresa Hall. On most days, they attend Mass in the motherhouse chapel and share meals with the Franciscan sisters. “We have lovely living quarters,” Sister Teresa said. “They’re very private so we have our own routine. We had our first Mass as a community in our prayer room last Sunday. Father Bernard McAniff, a Jesuit from Brebeuf [Preparatory School in Indianapolis], stopped by on his way back from Cincinnati.